Grandparents play a vital role in many families, being an important source of support to parents and enriching children's lives through a wider family network. This has been highlighted in research on grandparenting and intergenerational relationships for families in Australia (Brennan et al., 2013; Gray, Misson, & Hayes, 2005; Horsfall & Dempsey, 2011, 2013; Jenkins, 2010; Ochiltree, 2006; Weston & Moloney, 2014; Weston & Qu, 2009) and overseas (e.g., Barnett, Scaramella, Neppl, Ontai, & Conger, 2010; Fergusson, Maughan, & Golding, 2008; Griggs, Tan, Buchanan, Attar‐Schwartz, & Flouri, 2010; Mueller & Elder, 2003; Pebley & Rudkin, 1999; Tan, Buchanan, Flouri, Attar-Schwartz, & Griggs, 2010). This chapter uses LSAC to explore different ways that grandparents are involved in the lives of the LSAC children, capturing involvement from ages 0-1 years through to 12-13 years. It extends and updates previous LSAC research about grandparents (Gray et al., 2005). Grandparent involvement may take different forms, such as grandparents sharing a residence with children, providing child care or otherwise having contact with grandchildren. This chapter describes these different forms of grandparent involvement. Comparisons across different family forms and children of different ages highlight the variable and changing nature of grandparent involvement across children's lives. These analyses are from the perspective of the LSAC children and family, and so report on children's possible involvement with any of the child's grandparents. This is a different perspective than that of grandparents themselves about their involvement with grandchildren. Firstly, information on the household structure of LSAC children is used to identify the incidence of children having co-resident grandparents, and the characteristics of those grandparents and families. Gray et al. (2005) found that in Wave 1, 7% of the infants and 4% of the 4-5 year olds were living in the same household as a grandparent. While these numbers are quite small, previous research has shown that co-resident grandparents can make significant contributions to family life, especially to the financial circumstances of single-mother families (Mutchler & Baker, 2009). In fact, Gray et al. (2005) reported that in the infant cohort of LSAC in Wave 1, of children who had a parent living elsewhere from their primary parent's residence, almost one in four had a co-resident grandparent.1 Exploring the characteristics of co-resident grandparents (such as their age and health status), along with family characteristics, can provide some insights on the ways in which family life (in terms of child care arrangements and the amount of contact that children have with their grandparents) is different in these families compared to others. Information on financial wellbeing and sources of support provide some new insights about the functioning of grandparent co-resident families compared to others. The focus is on grandparents who are co-resident as part of a three-generation household, and does not cover grandparents who have primary care for grandchildren, since they are insufficiently represented in LSAC. For more information about these families refer to Brennan et al. (2013) and Weston and Moloney (2014). This chapter also covers grandparents as child care providers. In Australia, grandparents are a key source of child care, especially when children are very young and when mothers are employed (Baxter, 2013; Jenkins, 2010), just as is the case in other countries such as the United States (Baydar & Brooks-Gunn, 1998). Australian research has highlighted the significance of grandparent care (Baxter, 2013, 2014; Baxter, Gray, Alexander, Strazdins, & Bittman, 2007; Gray et al., 2005; Hand & Baxter, 2013; Horsfall & Dempsey, 2011, 2013; Weston & Qu, 2009) and this chapter expands on this, to explore how grandparent care is used in conjunction with other forms of care across different families and as children grow, and to describe the characteristics of grandparent-provided child care. As noted by Mutchler and Baker (2009) "caring 'from a distance' is characteristic of many grandparents whose roles may be defined in terms of affection and attachment but little day-to-day interaction" (p. 1577). The final aim of this chapter, then, is to include analyses of grandparent contact with grandchildren, to capture this form of grandparenting. Based on grandparents' reports, a significant proportion see their grandchild frequently. Horsfall and Dempsey (2011) reported that about three in four see their grandchild at least once a month. Gray et al. (2005) presented similar figures from children's perspectives, using Wave 1 of LSAC, in reporting on the proportion having at least monthly face-to-face contact with grandparents. Differences in contact are explored for maternal versus paternal grandparents as children grow and across different family forms. Exploring this for children growing up primarily in households headed by a single parent is especially useful as parental separation has previously been shown to potentially alter grandparents' involvement with grandchildren (Gray et al., 2005; Weston & Qu, 2009). What are the characteristics of grandparents living with the LSAC children, and of the families in which they live? What is the nature of grandparent-provided child care, in terms of hours per week, days per week and purpose? How much contact do children have with their grandparents? How does grandparent-provided child care and grandparent-contact change as children grow? What family characteristics explain variations in different aspects of grandparent involvement? Data from both cohorts and five waves are explored in this chapter, to provide insights on grandparents' presence and involvement as children grow. Throughout these analyses, we have excluded children being raised by grandparents, identified as families in which a grandparent was the child's primary carer. This resulted in the exclusion of between 13 and 19 cases each wave when the B and K cohorts were pooled, and was done because the number of families in this situation is too few to be able to produce reliable estimates of such families' circumstances. Three key sets of information are used in this chapter: one on grandparent co-residence, another on grandparents as child care providers, and another on children's contact with grandparents. Details about children's household structure were used to provide information about the co-residence of grandparents, on grandparents' relationships with resident parents and other characteristics. Details about the types of child care used by children were examined to determine to what extent grandparents provide child care, and how that care is contextualised with other forms of care across the ages of children in the B and K cohorts. Most of this information is as reported by the child's primary carer in the main interview. Finally, information on the frequency of contact between children and grandparents is analysed. This information is largely sourced from the primary carer's self-completion surveys. Other data items are introduced within each of the sections. For example, in exploring grandparental child care, parents' employment status is included, given the strong associations between maternal employment and child care use. We report on associations between family characteristics or primary carer characteristics and grandparent involvement. Almost all the primary carers are mothers (95% in single-parent families and 97% in couple families, across both cohorts and all waves), but a focus on primary carer (rather than maternal) characteristics allows father primary-carer families to be included in the analyses. In the analyses of grandparents, grandparents could be identified as maternal or paternal grandmothers or grandmothers through their relationship to the study child and their relationship to parents in the household. Even in single-parent households, it was possible to identify whether a co-resident grandparent was maternal or paternal.4 A very small number of co-resident great-grandparents of study children were counted as if they were grandparents. Grandparents who were visitors or temporary household members were not counted. For the analyses of grandparent-provided child care, details were not captured of whether care was specifically provided by grandmothers or by grandfathers, but (from Wave 2) was captured as care provided by maternal or paternal grandparents (or both). For the analyses of children's contact with grandparents, from Wave 2, information could be derived about contact with maternal or paternal grandparents, with some limitations that are discussed in that section concerning the incomplete information for single-parent families. Information is not collected separately in respect to grandmothers and grandfathers. It was not possible to determine whether children actually had, at the times of data collection, living maternal or paternal grandmothers or grandfathers. It would of course be expected that as children grow older they would be less likely to have grandparents still living, and those living may be less accessible to grandchildren due to heightened frailty or health problems. Changes in grandparent involvement by child age may be a consequence of such changes. But also, given that fathers are on average older than mothers, such age differences might translate into children having older (or not living) paternal grandparents compared to maternal grandparents, and having older (or not living) grandfathers compared to grandmothers. These differences are likely to in part explain any observed differences between these grandparents' involvement with children. For example, for mothers in couple families in Wave 5 of the K cohort, the median birth years of their mothers was 1942 and of their fathers was 1939. For fathers, the median birth years of their mothers was 1939 and of their fathers was 1936. Within these families at Wave 5, when asked about children's contact with grandparents, it was reported that 7% of children had no maternal grandparents and 10% had no paternal grandparents, and the birth year of grandparents in these families was earlier than that reported for other families. In analysing children's contact with grandparents in section 1.5, we report how these figures changed over the waves of LSAC. More detailed information about the data used is presented within each of the sections that follow. In Wave 1 of LSAC, 7% of the infants and 4% of the 4-5 year olds were living with a grandparent. Table 2.1 shows the percentage of children who had a co-resident grandparent remained at around these levels across the five waves of the study for the B and K cohorts. Across all waves and the two cohorts combined, this equates to an overall average of 5% living with a grandparent. This is somewhat lower than the 8% of children reported to be living with grandparents in three-generation households in the US in 2012 (Dunifon et al., 2014). 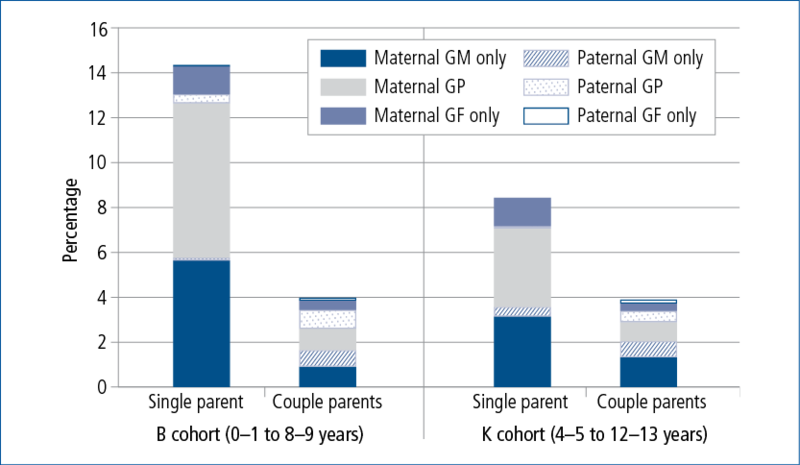 Notes: Percentages in the maternal and paternal rows do not totally add up to the total grandparent present row, as a very small number of grandparents were not identified as either maternal or paternal grandparents (< 1%). a These percentages include those with grandmother present as well as grandfather present. # Relative Standard Error > 25%. Percentages may not sum exactly to the subtotals due to rounding. The percentage of LSAC children who lived with a grandparent was higher at younger ages, with the percentage living with a grandparent highest at age 0-1 year (7%) and 2-3 years (6%) compared to older ages (varying between 4% and 5%). Children were more likely to be living with a grandmother than with a grandfather across all ages, although the patterns by child age were consistent for grandmother and grandfather co-residence. When children lived with a grandfather, they usually also had a grandmother co-resident, such that children lived with both grandparents. It was rare for children to be living with a grandfather without a grandmother also present, when compared to living with only a grandmother. Analyses of these data longitudinally show that the presence of a co-resident grandparent is not very stable, a finding that has been observed elsewhere (Pilkauskas & Martinson, 2014). Overall, across five waves of LSAC, 13% of children in the B cohort (covering 0-1 year through to 8-9 years) and 10% in the K cohort (covering 4-5 years through to 12-13 years) had a grandparent present for at least one of the five waves. In the B cohort, this included 9% with a grandparent co-resident at one or two waves only, 3% for three or four waves and 1% for five waves. In the K cohort, this included 7% with a grandparent co-resident at one or two waves only, 2% for three or four waves and 2% for five waves. Information about grandparent co-presence is disaggregated in Table 2.1 to show how children's grandparents were related to the children's mother or father. That is, if the grandparents were the parents of the child's mother they were classified as maternal grandparents, and if parents of the child's father, they were classified as paternal grandparents. Overall, it was more likely that co-resident grandparents were maternal grandparents rather than paternal grandparents. This applied to grandmothers as well as grandfathers. The higher incidence of the co-presence of maternal, rather than paternal, grandparents largely reflected that in single-parent households, the majority of grandparental co-residence involved maternal grandparents, either as the maternal grandmother alone or both maternal grandparents (Figure 2.1). Within two-parent families there was more diversity of co-resident grandparental relationship types. Table 2.1 shows that among 0-1 year olds (Wave 1 of the B cohort) one in four children living in a single-parent household had a co-resident grandparent. This percentage declined over later waves for this cohort, as seen in the percentage of children in single-parent households who have a co-resident grandparent in Chapter 3 of this volume (the percentage declined from 24% to 8% over the five waves). However, even averaged over five waves (from 0-1 through to 8-9 years), the percentage living with a grandparent was higher in single-parent households than in other household forms. This is indicated in Figure 2.1, with the height of the bars being the percentage of children living with a grandparent within each household type. 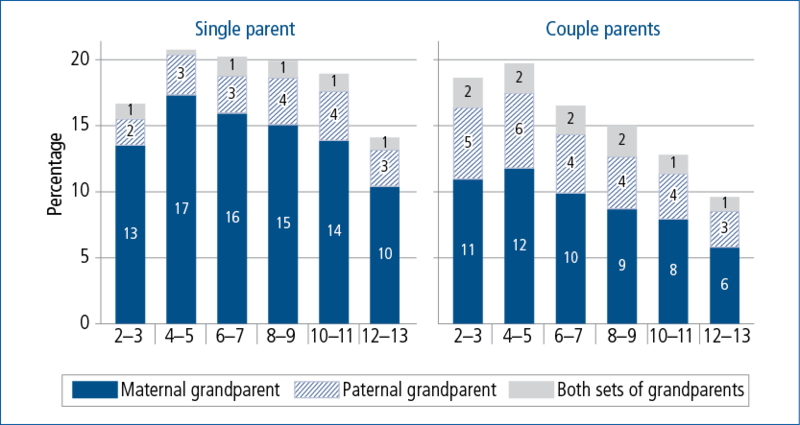 The difference between single-parent and couple-parent households was also apparent among somewhat older children (in the K cohort), although was less marked than at the younger ages of children in the B cohort. Consistent with the earlier analyses, having a co-resident grandparent was significantly more likely in single-parent households. When the child's primary carer was relatively young, families were significantly more likely to have a co-resident grandparent, and this was especially marked in the younger cohort. Differences according to the primary carer's educational attainment were less marked, although those with lower educational attainment were more likely to have a co-resident grandparent than those with higher educational attainment. 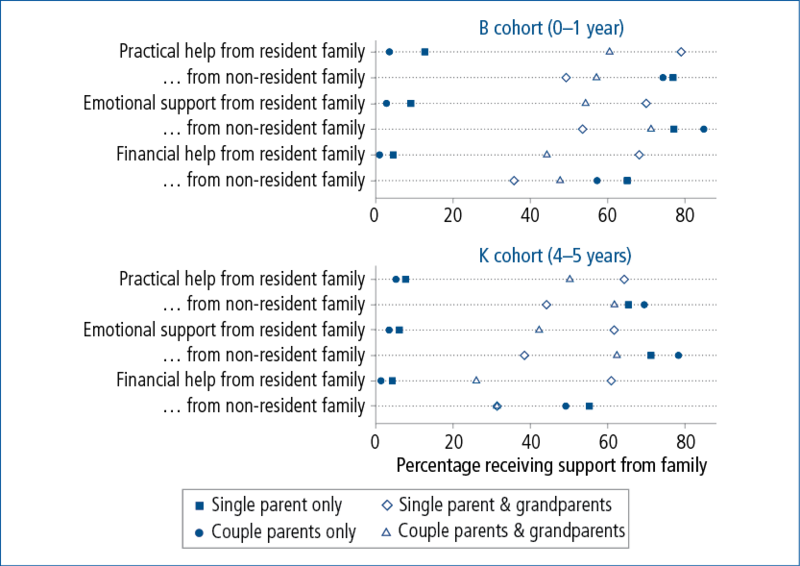 A family-level variable that identified whether or not both (or single) parents were employed was not significantly associated with grandparent co-residence for 4-5 year olds (K cohort, Wave 1), but for 0-1 year olds (B cohort, Wave 1) grandparent co-residence was less likely when all parents in the household (whether one or two) were employed. Only small differences were apparent according to an area-level classification of the remoteness of residence (only 4-5 year olds). Notes: GM = grandmother: GF= grandfather; GP = grandparents, i.e., both grandmother and grandfather. Most single parents are single mothers (95% across the sample). Two-parent families include two-biological parent families as well as those with one or two non-biological parents. As noted previously, grandparental co-residence may be explained by a number of circumstances. It may be to provide some support or assistance to the grandparent. It may simply be to allow for family members to spend time together and develop relationships. It may also be to allow grandparents to provide some support to the children and parents, especially to provide assistance with housing or financial support for a time. Existing research reveals that the formation of multigenerational households, such as is formed through grandparent co-residence, is usually done to address the needs of the younger generation, as reflected in the last of these reasons (see Mutchler & Baker, 2009 for related literature). Not surprisingly, research has shown that single parents are particularly advantaged when living in a multigenerational household, such that single parents living with grandparents have significantly better financial circumstances compared to those living alone (Mutchler & Baker, 2009). This reflects that pooling living costs, or pooling or access to the grandparents' resources (housing and other) may improve the economic circumstances of families who would otherwise be faced with difficult financial circumstances. Reasons for co-residence of grandparents are not collected in LSAC, and so we cannot determine whether co-residence is primarily for the benefit of the grandparent/s or for the rest of the family. However, information about parents' housing tenure provides insights, especially in the identification of parents who are living rent-free, who are likely to be living in the grandparents' home. Notes: Significance (chi-square) tests used to compare proportions with, without co-resident grandparents. a This is derived from parent age and child age at Wave 1. b Some LSAC families live in remote areas but LSAC is not representative of families living in remote areas. *** p < .001; ** p < .01; * p < .05. Percentages may not total exactly 100.0% due to rounding. 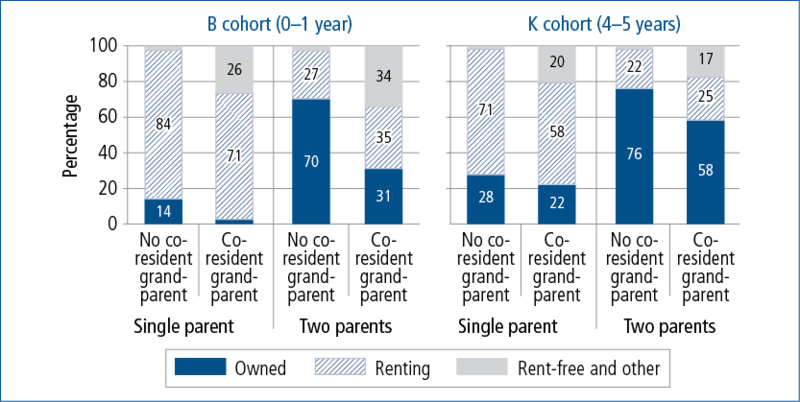 Figure 2.2 shows the parent-reported housing tenure at Wave 1 for families with and without a co-resident grandparent, also classifying families by cohort and parental relationship status. The category of most interest is that of "living rent-free or other", which captured a significantly larger proportion in the grandparent co-resident households. The findings suggest that within families who are co-resident with grandparents, approximately one fifth to one third (varying across groups) were possibly living in the grandparents' home, with no or very low housing costs. Parents in these grandparent co-resident households were also less likely to be home owners or purchasers compared to those who were not, suggesting a degree of socio-economic disadvantage associated with the incidence of grandparent co-residence, at least for some families. However, within two-parent households of 4-5 year olds a large proportion with co-resident grandparents owned or were purchasing their own home. Together, this information suggests considerable heterogeneity in the grandparent co-residence group. Without also having information about co-resident grandparents' own housing tenure, we are somewhat limited in our being able to explain the housing circumstances within co-resident grandparent families. Nevertheless, in future analyses of these data it may be useful to consider how tenure intersects with grandparent co-residence in different regional areas (such as remoteness or socio-economic disadvantage) and in families with different characteristics (such as parental education or employment). Notes: Owned includes "being paid off by you and/or your partner" or "owned outright by you and/or your partner". Renting is "rented or boarded at by you and/or your partner" plus small numbers who reported tenure of "being purchased under a rent/buy scheme" and "occupied under a life tenure scheme". Rent-free and other includes "live here rent free" (86% of cases) and "none of these" (14%). As noted above, a consequence of, and perhaps a motivation for, grandparental co-residence may be that parents are able to avoid certain financial hardships, through sharing of resources or being able to draw upon the resources of the grandparent. This was explored, using LSAC, by counting how many of a list of financial hardships each family reported experiencing in the previous year. These hardships were having gone without meals, been unable to heat or cool their home, having had to pawn or sell something, being unable to pay the mortgage or rent on time, having sought assistance from a welfare or community organisation, having been unable to pay bills on time.7Figure 2.3 shows the distribution of number of hardships by family structure and grandparent co-residence as at Wave 1. In families of 0-1 year olds (the B cohort), single parents without a co-resident grandparent were the most likely to have experienced some hardships, with 21% having experienced three or more hardships, 20% experiencing two hardships and 27% experiencing one hardship. In contrast, single parents with a co-resident grandparent were much more like couple parent families, although with slightly more experiencing one or more hardships. The number of financial hardships varied little for households of two parents according to whether or not grandparents were present. In the families of the 4-5 year old children (in the K cohort), single-parent households with no co-resident grandparent were similar to those of the 0-1 year olds in the B cohort with respect to the number of hardships reported. As for the younger children, the single parents with no co-resident grandparent were the most likely to have experienced hardships. The single parents with grandparents, however, were less like the two-parent families in the families of 4-5 year olds, having a higher likelihood of experiencing hardships than two-parent families. For both cohorts, two parents with co-resident grandparents were less likely to experience hardships than single parents with co-resident grandparents. These findings are consistent with analyses for the US, in which Dunifon et al. (2014) explained that these differences have to do with differences in home ownership within these two groups, with housing of two parents more often owned by those parents, and single parents more often living in homes owned by the grandparents. This is also consistent with what is suggested by the housing tenure information presented above. The provision of help and support by co-resident grandparents to parents is also apparent in Figure 2.4, which shows (using Wave 1) the percentage of parents reporting that they received practical help, emotional support or financial help from resident family or from non-resident family. Parents with co-resident grandparents, and especially single parents, said very often that they received any of these forms of help or support from resident family, which we would assume includes grandparents in many cases. Note, though, that not all parents with co-resident grandparents report that they receive these forms of help or support from resident family. The figure also shows that those parents who do not live with a grandparent were more likely to receive help or support from non-resident family, compared to those with a co-resident grandparent, although the differences were not always very marked. What we do not know is to what extent LSAC parents (or indeed children) provide some degree of help or support to the co-resident grandparents. It seems likely that this would occur, especially when co-resident grandparents are older or need help managing a medical condition. The median age of co-resident grandmothers was 53 and of co-resident grandfathers was 55 (5% of grandmothers and 9% of grandfathers were aged over 70 years). Thirty-six per cent of co-resident grandmothers and co-resident grandfathers had a long-term health condition (i.e., a medical condition or disability that had lasted or was likely to last for 6 months or more). Twenty-one per cent of co-resident grandmothers and 19% of co-resident grandfathers mainly spoke a language other than English at home. The median age of co-resident grandmothers was 61 and of co-resident grandfathers was 64 (23% of grandmothers and 34% of grandfathers were aged over 70 years). Forty-seven per cent of co-resident grandmothers and 44% of co-resident grandfathers had a long-term health condition. Thirty per cent of co-resident grandmothers and 35% of co-resident grandfathers mainly spoke a language other than English at home. These age differences (across cohorts, and of grandmothers and grandfathers) would be expected (see section 2.2). The higher incidence of health conditions for grandparents of 4-5 year olds might also reflect the age differences between these grandparents and those of the 0-1 year olds. However, within cohorts, health differences did not emerge when comparing grandmothers to grandfathers. When these characteristics were explored across waves, there was considerable variation, such that the only (unsurprising) trend was for grandparents to be older at later waves. Some differences were apparent according to whether grandparents were living with the LSAC children in a single-parent or two-parent household, as shown for data pooled across waves in Figure 2.5. Grandparents were older and more likely to be non-English speakers in couple-parent households than in single-parent households. Differences were not apparent for grandparents' likelihood of having a long-term medical condition. The findings from this section are summarised and discussed further in the final section of this chapter, after the analyses of grandparents as child care providers, and grandparents' contact with children. This section focuses on grandparents as child care providers. In Australia, grandparents are a key source of child care, especially when children are very young and when mothers are employed (Baxter, 2013; Jenkins, 2010). Australian research has highlighted the significance of grandparent care, including research using LSAC (Baxter, 2014; Baxter et al., 2007; Gray et al., 2005; Hand & Baxter, 2013) and other data sources (Baxter, 2013; Horsfall & Dempsey, 2011, 2013; Weston & Qu, 2009). Likewise, international literature has shown that families greatly value grandparent-provided care and often use it as a supplement or alternative to formal care arrangements (Brandon, 2000; Goodfellow & Laverty, 2003; Wheelock & Jones, 2002). Note: Based on pooled data on co-resident grandparents across waves, and so show average characteristics across waves. For grandmothers, n = 1,756 from 923 families with co-resident grandmothers at one or more waves. For grandfathers, n = 1,124 from 620 families with co-resident grandfathers at one or more waves. For each, there were fewer observations for a medical condition, which was not available in Wave 4. This section extends existing research on grandparent-provided child care in Australia, to provide more detail about the nature of that care, and on the extent to which grandparent care supplements other forms of care. Where possible, we analyse whether care was provided by maternal or paternal grandparents, but we do not have information on whether that care was provided by grandmothers or grandfathers, as has been explored by Horsfall and Dempsey (2013) and Hank and Buber (2009), for example. First, this section begins with a broad overview of grandparent-provided child care across the ages of children in the two cohorts of LSAC. Then, more detail is provided in two separate subsections, one on care for under-school-aged children and the other on school-aged children. For children under school age, information about child care was collected in LSAC by asking parents about their regular use of child care over the previous month, excluding casual or occasional babysitting.8 Details of children's participation in formal child care (such as long day care or family day care) or informal care (such as grandparent or other relative care) were collected and, at the appropriate ages, this was captured separately to participation in preschool. When children became school-aged, parents were asked about their current use of care for children before school, after school or at other times. There were some changes to questions used to capture this information across the waves.9 Care for school holidays was also collected for school-aged children but this is not covered in this chapter - see Baxter (2014) for analyses of these data. To first provide an overview of grandparent-provided child care, Figure 2.6 shows the percentage of children (by age and cohort) who were regularly cared for by grandparents. From Wave 2, this was separately identified as care provided by a maternal grandparent or paternal grandparent, as shown. The percentage of children in some grandparent care was highest when children were under school age, with a decline in the proportion being cared for by grandparents as children progressed through the primary school years. Figure 2.6 shows that at any age children were more often cared for by maternal grandparents than by paternal grandparents. For example, 18% of children aged 2-3 years were cared for by either grandparent and this included 13% cared for by maternal grandparents (72% of 2-3 year olds cared for by a grandparent) and 7% cared for by paternal grandparents (39% of 2-3 year olds cared for by a grandparent). As is evident in these data, some children were cared for by maternal grandparents as well as paternal grandparents (11% of those sometimes cared for by grandparents at this age). Among children cared for by a grandparent, those in single-parent households were less often cared for by paternal grandparents and more often cared for by maternal grandparents compared to children in two-parent households. Figure 2.7 shows this, for children aged 2-3 years and older. Note: Grandparent care was not collected separately in respect to maternal or paternal grandparents in Wave 1. 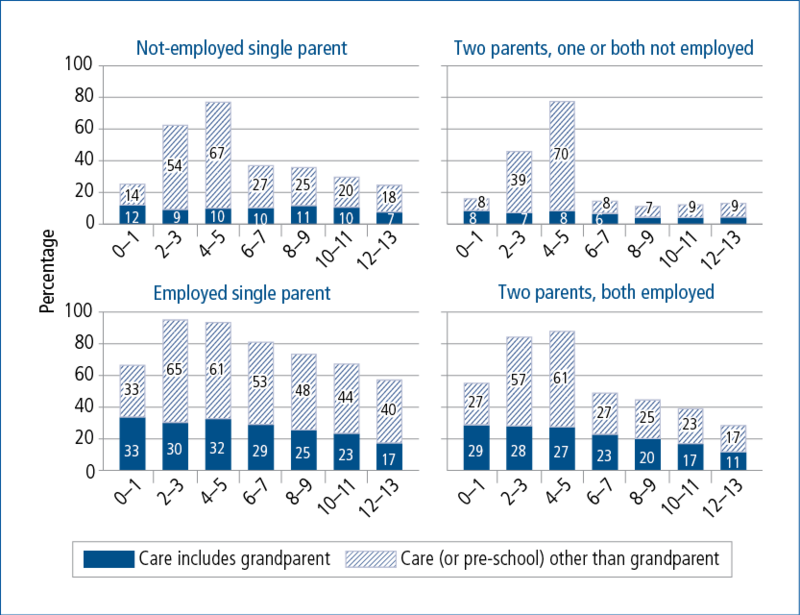 In addition to child age and parent's relationship status, children's care arrangements are expected to be strongly associated with parents' employment status (Baxter, 2013).10 This is apparent in Figure 2.8, which also contextualises the grandparent child care with other forms of care or preschool. For children with a not-employed parent, there were lower percentages in care or preschool overall, although at ages 2-3 years and 4-5 years, care was often used, which no doubt reflects that formal care or preschool is especially valued as children approach school age, given the opportunities these arrangements provide for social and educational development (Hand, Baxter, Sweid, Bluett-Boyd, & Price-Robertson, 2014). Grandparent care, however, did not have the same pattern by child age for these families, with the percentage in grandparent care varying only slightly as children grew. Note: Grandparent care was not separately identified as maternal or paternal at Wave 1. Notes: Care other than grandparent includes informal or formal care. Informal care includes friends or neighbours, other relatives, a parent living elsewhere or nannies. Formal care includes long day care, occasional care, family day care, before or after school care or preschool or kindergarten. Among children with employed parents, the percentages in any care were significantly higher than for children with a not-employed parent across all ages, except for at 4-5 years. Across all ages, this was reflected in a higher percentage in grandparent care. Also across all ages, children with employed single parents were more likely to be in some grandparent care, compared to children with two employed parents. The differences were quite small at some ages, though. There were far greater differences between employed single parents and dual-employed couple parents in relation to children's participation in care other than grandparent care. This was most likely in the single-parent households. Figure 2.9 looks in more detail at the care arrangements of children who have some grandparent child care. Overall, children cared for by a grandparent were often also in other care arrangements; however, this varied considerably by child age. At 0-1 year, 18% of children were in grandparent child care. Of those, 13% were only in grandparent care. By 2-3 years, out of 18% in grandparent care, only 7% were only in grandparent care, and at 4-5 years, 3% were only in grandparent care out of a total of 20% in some grandparent care. Once children were school age, it was more likely that children were only in grandparent care rather than a combination of grandparent and other care. Notes: Informal care includes friends or neighbours, other relatives, a parent living elsewhere or nannies. Formal care includes long day care, occasional care, family day care, before or after school care or preschool or kindergarten. Parents' employment status and children's age are key characteristics in describing which children are cared for by grandparents, as seen above and as evident in other research (Baxter, 2014; Hand & Baxter, 2013; Silverstein & Marenco, 2001; Vandell, McCartney, Owen, Booth, & Clarke-Stewart, 2003). While it is of interest to examine which other characteristics of families predict greater use of grandparent care, we leave this to further research, as this would require more comprehensive analyses than can be covered here. It is worth noting, however, the connection between the provision of grandparent care and the focus of the previous subsection on grandparent co-residence. Not surprisingly, children were more likely to be cared for by a grandparent when they shared a home with one. Among children with a co-resident grandparent, grandparents provided care to 55% of under-school-aged children and 50% of school-aged children with employed parents; 18% of under-school-aged children and 25% of school-aged children with a not-employed parent. In comparison, among children without a co-resident grandparent, grandparents provided care to 27% of under-school-aged children and 18% of school-aged children with employed parents; 8% of under-school-aged children and 5% of school-aged children with a not-employed parent. The longitudinal nature of LSAC allows us to explore to what extent grandparent child care is experienced across the waves of LSAC, to examine the stability of this care arrangement. (This is just done for the B cohort, over ages 0-1 year through to 8-9 years, since we have not used the first two waves of the K cohort to analyse grandparent care.) In this cohort, 44% of children had been cared for by a grandparent at one or more of the five waves. Overall, 19% were in grandparent care at one wave only. Most commonly, this one wave was when the children were aged 0-1 year, although significant proportions were only in grandparent care at each of the other four waves. Another 11% were in grandparent care at two waves, with the grandparent care more often occurring during the under-school ages. The remainder were 7% having been in grandparent care for three waves, 4% for four waves and 2% for five waves. These findings suggest that grandparent care is not a persistent or consistent form of care for many children across their early years. This is likely to reflect that parents' needs for any child care change as parents (usually mothers) move into and out of employment, as children spend more time in formal care or preschool, and as the availability of grandparents changes. The two following subsections now provide some more detail about care provided to under-school-aged children and school-aged children. At 0-1 year, the average duration of care per week was 17.3 hours. This included an average of 6.4 hours cared for by grandparents, 3.0 hours in other informal care and 8.0 hours in formal child care. At 2-3 years, the average duration of care (including preschool) per week was 20.5 hours. This included an average of 3.6 hours cared for by grandparents, 2.0 hours in other informal care, 14.0 hours in formal child care and just less than 1.0 hour in preschool. At 4-5 years, the average duration of care (including preschool) per week was 21.6 hours. This included an average of 2.3 hours cared for by grandparents, 1.6 hours in other informal care, 8.3 hours in formal child care and 9.3 hours in preschool. 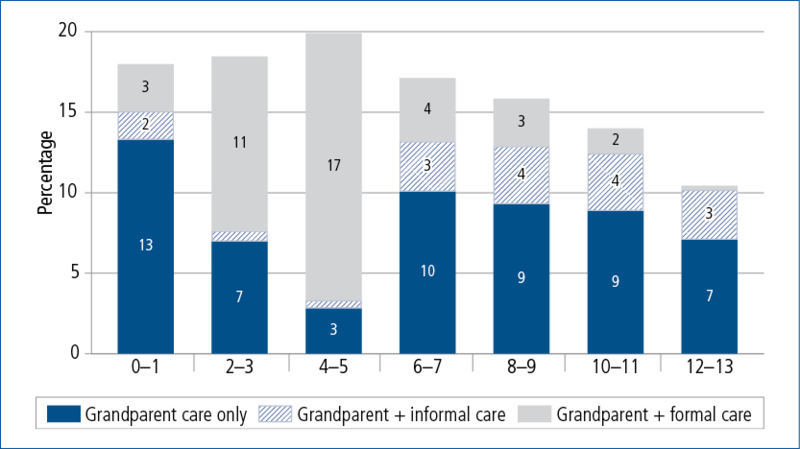 Across the under-school-aged period, formal care is the most common care arrangement, followed by grandparent care, followed by other informal care. Figure 2.10 presents information on the average weekly hours children were in different forms of care, by parental employment status and child age, and separating those who were in some grandparent care from those who were not. For children with employed parents who did not have grandparent care, the average amount of care changed little as children grew through the under-school ages, remaining at around 21 hours per week. The type changed, such that children spent more time in preschool at 4-5 years than at earlier ages. For children with care other than grandparent care who had a not-employed parent, the average hours in care increased, reflecting more time in formal child care at 2-3 years, then more time in preschool (offset by less time in child care) at 4-5 years. For children with employed parents who did have grandparent care, the amounts of time in care changed considerably as children grew, although the time spent cared for by grandparents did not change a great deal. These children spent, on average, 14 hours per week being cared for by grandparents at 0-1 year and 2-3 years, and 11 hours per week at 4-5 years. Their time in other forms of care changed over these ages, with more time in formal child care at 2-3 years and more time in preschool at 4-5 years. Children who had some grandparent care and a not-employed parent spent an average of 7 hours in grandparent care at 0-1 year, then an average of 10 hours per week at 2-3 years and 4-5 years. Like the other children, their time in formal child care was higher at 2-3 years and in preschool at 4-5 years. 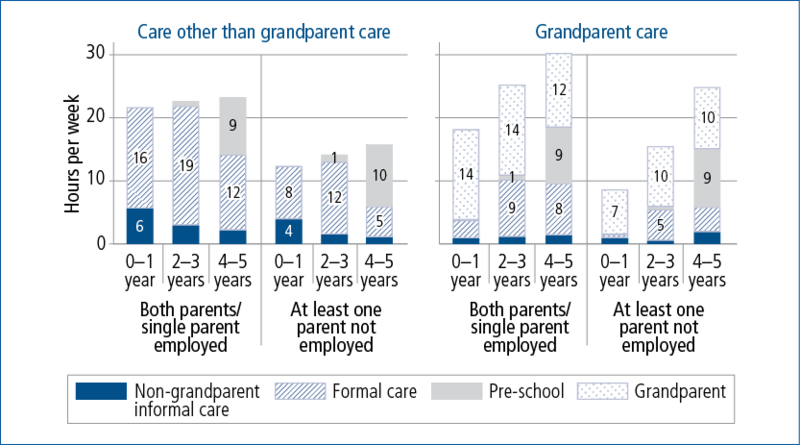 Figure 2.9 showed how grandparent care was combined with other forms of child care, by child age. Here this is evident also, with grandparent care reported to be the main form of care for 86% of 0-1 year olds in grandparent care, 63% of 2-3 year olds and 31% of 4-5 year olds. Among children in grandparent care, this care was more often provided in the child's home when children were aged 0-1 year (45% were cared for in their own home), compared to 34% at 2-3 years old and 32% at 4-5 years old. Among children who were cared for somewhere else, this was most likely to be in the home of their grandparents. Information about the hours spent in grandparent care allow some elaboration beyond the averages shown above. There was considerable variation in the number of hours children were cared for by grandparents. For example, at 0-1 year, 26% spent less than 5 hours per week in grandparent care, 33% spent 5-9 hours per week in grandparent care, 21% spent 10-19 hours per week in grandparent care and 20% spent 20 hours or more in grandparent care. The distribution of hours did not vary greatly from this at 2-3 years or 4-5 years. Looking at how many days per week children were in grandparent care, it was most common for children to have been cared for just 1 day a week (about half the children in grandparent care), with about one in four cared for 2 days per week, and the rest distributed over other numbers of days. There were often two (or more) adults present when the child was being cared for by grandparents. Presumably this often indicated the presence of both a grandmother and grandfather. This was the case for 40% of 0-1 year olds, 46% of 2-3 year olds and 49% of 4-5 year olds in grandparent care. For the balance, just one adult was usually present. The number of months in total that children experienced grandparent care of course varies by age, but even looking at the older children here, there were very diverse experiences. At 4-5 years, 17% of children experienced grandparent care for most of their life (4 years or more) and another 14% had been in grandparent care for 3 years or more. Note: Children aged 4-5 years already attending school are excluded. Percentages may not total exactly 100.0% due to rounding. Ninety-eight per cent of parents of under-school-aged children reported that when children were in grandparent care, there were usually one to five children present. We can expand on this from information provided by grandparents who responded, in Waves 1 or 2, to the home-based carer component of LSAC.14 Almost all grandparents reported that they were caring only for the study child when the child was aged 0-1 year, while 61% said they were caring only for the study child at 2-3 years, and another 37% said they were caring for up to five children. Few parents (5-6%) paid the grandparents for the child care they provided. Not surprisingly, then, according to the grandparent respondents, 99% reported that they were not Child Care Benefit registered carers. This section presents further information on the care provided to school-aged children by their grandparents. 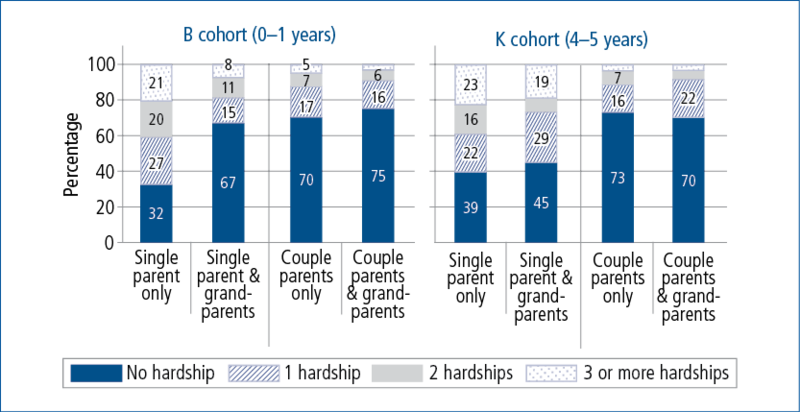 The analyses span the ages 6-7 years (Wave 4 of the B cohort), 8-9 years (Wave 5 of the B cohort and Wave 3 of the K cohort), 10-11 and 12-13 years (Waves 4 and 5 of the K cohort). Prior to Wave 3, the questions about child care for school-aged children differed, and so those data (Wave 2 of the K cohort) were not used. The additional information provided here relates to the time of day that grandparent and other care is provided to school-aged children. Figure 2.11 shows child care according to whether it was provided before school, after school, or at other times (weekends or evenings). Children in some child care are classified according to whether they only had grandparent care, they had grandparent care plus some other (formal or informal) child care, they only had informal child care other than grandparent care, or they had formal child care (including those who also had non-grandparent informal care). Just less than one third of 6-7 year olds were in some after-school care, although this declined considerably as children grew, with 20% of the 12-13 year olds in some after-school care. At age 6-7 years 13% of children were cared for by grandparents after school (8% by only grandparents and 5% had grandparent care and some other care). This declined as children grew, with 8% cared for by grandparents after school at age 12-13 years. Changes in formal and non-grandparent informal care after school were much more apparent as children grew, with a decline in the proportion in formal child care and an increase in the proportion in informal (non-grandparent) arrangements. Note: Children may be in grandparent care at more than one of the specified times. Before school hours, the arrangements were more diverse and the patterns by child age more varied. Fewer than 5% of children were cared for by grandparents before school hours. For care at other times, children were most often in informal arrangements other than grandparent care, with fewer than 5% cared for by grandparents at these times, declining slightly by child age. The key findings from the above sections, in conjunction with other findings, are discussed after an examination of children's contact with grandparents, below. This section explores the frequency of children's face-to-face contact with grandparents as children grow and across different family forms. Information about children's contact with grandparents primarily comes from questions on this, asked of the child's primary carer in the self-completion component of LSAC. These questions have changed across the waves of LSAC and, from Wave 2, the frequency of contact with maternal grandparents can be explored separately from contact with paternal grandparents.16 Given the changes in questions, a challenge has been in correctly taking account of children's contact with paternal grandparents in the case of single-parent families.17 The data do allow broad estimates of grandparent contact to be derived, though, so we have used these data to compare across different families. The information on children's contact with grandparents cannot be separated into information about contact with grandmothers versus grandfathers. The percentage of children who had some contact with a maternal grandparent ranged from 94% of children age 2-3 to 88% of children age 12-13. The percentage of children who had some contact with a paternal grandparent ranged from 88% of children age 2-3 to 82% of children age 12-13. Some of the decline in children having contact with grandparents, as children grow, has been due to the death of those grandparents, as discussed in section 2.2. For example, 2% of 2-3 year old children (in the B cohort at Wave 2) were reported to have no maternal grandparents, but this was 7% of children at 12-13 years (in the K cohort at Wave 5). Children with no grandparents are still included in the calculations. While most children had some contact with their grandparents, regular contact was less common. Figure 2.12 shows the percentage of children, by age and cohort, who had at least monthly contact with their grandparents (with estimates of regular contact for children with a parent living elsewhere, as described in footnote 18). The percentage of children having at least monthly contact with a (maternal or paternal) grandparent was highest when children were under school age and declined with the age of the child. Still, the majority of children keep in regular contact with grandparents. Around 80% of children had at least monthly contact with a grandparent at 4-5 years, compared to 70% of children aged 12-13 years. The patterns by the child's age are similar to those reported previously for grandparent-provided child care (Figure 2.6). As already discussed, the trends in contact by the child's age may be more a reflection of the ageing of the grandparents, rather than of the children themselves. Similarly, differences in contact between maternal and paternal grandparents will partly be explained by children being less likely to have paternal than maternal grandparents, given that maternal grandparents are likely to be younger. Across all ages, it was more common for children to have regular (at least monthly) contact with their maternal grandparents than their paternal grandparents. By age 12-13, 55% of children had regular contact with their maternal grandparents, compared to 46% for paternal grandparents. Note: Refer to footnotes 17 and 18 for information about derivation of these data. Source: Waves 1 to 5 of the B and K cohorts. 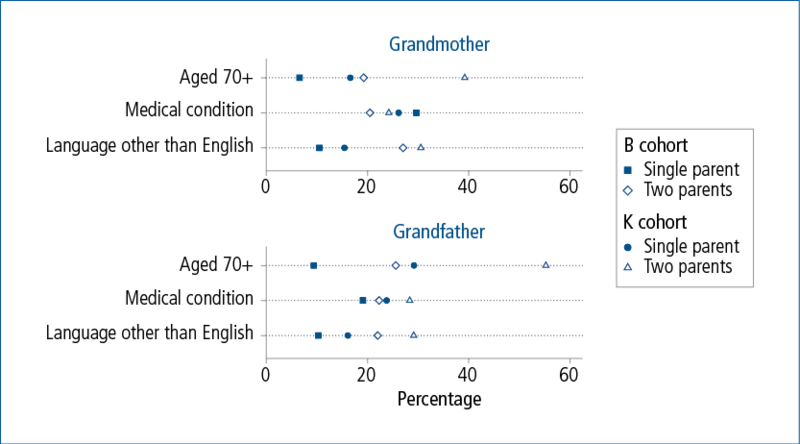 When we explored differences in maternal and paternal grandparent involvement in previous sections, the higher rates of maternal grandparent involvement were particularly apparent in single-parent households, with differences less marked within two-parent households. Consistent with this, Figure 2.13 shows that for grandparent contact, compared to children in two-parent households, those in single-parent households were much less likely to have contact with both sets of grandparents, and more likely to be only in contact with their maternal grandparents. (As noted previously, the vast majority of single parents are single mothers.) This figure shows the percentage of children who have any contact with their grandparents, depending on whether they are living in a two-parent or a single-parent household. The height of each bar gives the percentage who have some contact with either grandparent, such that the balance is those with no grandparents and with no contact with grandparents. In analyses below we explore this more. Notes: Refer to footnotes 17 and 18 for information about derivation of these data. “Any contact” includes monthly contact or less regular contact. The balance includes children with no contact with grandparents and those who do not have grandparents. Among children in two-parent households, the majority had some contact with both sets of grandparents through the ages of 2-3 to 12-13 years. Still, the percentage of children who had contact with both sets of grandparents declined slightly over time; and of those children in two-parent households who only had contact with one set of grandparents, it was more common for that contact to be with their maternal, rather than their paternal grandparents. Regardless of whether the child lived with one or two parents, the percentage of children who had daily or weekly contact with maternal grandparents declined with age. Very few children at any age have grandparents with whom they never had face-to-face contact. 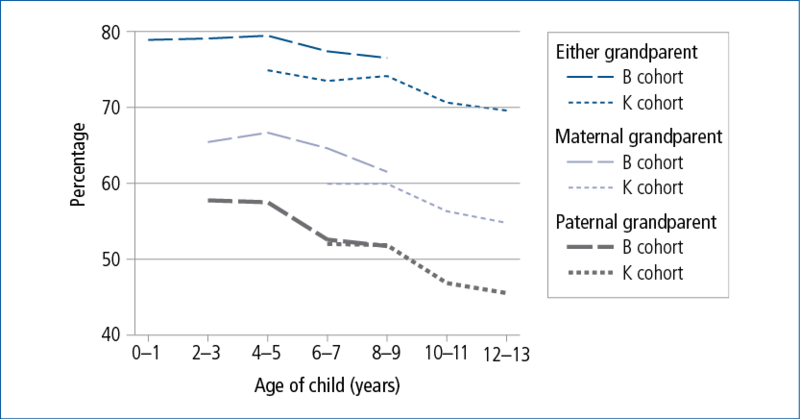 The height of the columns in Figure 2.14, which represents the percentage of children with maternal grandparents, declines with the age of the child. Notes: Column height represents the percentage of children who had maternal grandparents. Where the amount of contact is unknown, contact is assumed to be at least monthly. At 2-3 years, 48% of children in two-parent households had either daily or weekly contact with a maternal grandparent but only 34% had daily or weekly contact with a paternal grandparent. By the age of 12-13, these percentages dropped to 32% for maternal grandparents and 20% for parental grandparents. Notes: Column height represents the percentage of children who had paternal grandparents. Where the amount of contact is unknown, contact is assumed to be at least monthly. Of those who had daily contact with a (maternal or paternal) grandparent at 2-3 years, 36% still had daily contact at 8-9 years; while 42% saw them weekly and 10% saw them monthly. Of those who had weekly contact at 2-3 years, 59% still had weekly contact at 8-9 years, while 26% saw them monthly at 8-9 years, and 7% had increased their contact to daily. Among children with monthly contact with a grandparent at 2-3 years, 50% were still seeing grandparents monthly at 8-9 years. While 27% of these children at 8-9 years saw grandparents less frequently, 21% had increased their contact to weekly. Of those children who had less than monthly contact with a grandparent when they were 2-3 years old, this was still the case at 8-9 years for 62% of children, but 11% had moved to monthly contact and 20% to at least weekly contact with a grandparent. The above analyses have shown that it is quite common for children to have at least some contact with their grandparents, and regular contact is more common for maternal than paternal grandparents, particularly for children in single-parent households. Many factors can influence the amount of contact that grandparents have with their grandchildren, some key ones are likely to be geographical distance, grandparents' health status and their own employment status, and the nature of the grandparents' relationship with the child's parents. We do not have information on geographical distance, nor do we know about the health status of grandparents who are not resident in the LSAC household. We do not know about grandparents' employment, even if they are co-resident. Information is also not collected that allows some classification of the quality of the parent-grandparent relationship at the time of the survey. It is likely that parents' own childhood experiences might contribute to later relationships with parents. In Table 2.4, we consider whether grandparent contact varies according to parents' feelings about the happiness of their childhood. For simplicity, this has just been done for mothers' reports of happiness, against children's contact with maternal grandparents (having at least monthly contact, versus no or less regular contact). The table shows that in both cohorts, children were more likely to have at least monthly contact with their maternal grandparents if their mother reported having a happy childhood, with the highest percentage having at least monthly contact when mothers said they had a "very happy" childhood. Still, even among children whose mothers reported having an unhappy or very unhappy childhood, just over half of children in the B cohort and 45% of children in the K cohort had at least monthly contact with their maternal grandparents. Notes: Sample is restricted to children with maternal grandparents whose mothers responded to the question about childhood happiness. Significance (chi-square) tests used to compare proportions with, without monthly contact with grandparents. *** p < .001; ** p < .01; * p < .05; ns p > .05. Percentages may not total exactly 100.0% due to rounding. These data are likely to reflect stronger parent-grandparent relationships when parents' retrospective reports of their own childhood were happier. In fact, Table 2.4 also shows the frequency of contact between mothers and their parents, collected at the same time as the information on children's contact with these grandparents. For these data, "contact" is broader than face-to-face contact, and so we have shown the percentage having at least weekly contact. The majority of mothers have at least weekly contact with their mother (84% in the B cohort and 79% in the K cohort). Within each cohort, weekly contact is less likely when mothers reported having had an unhappy childhood, and is highest when mothers reported having had a very happy childhood. When the child's primary carer was relatively young at the child's birth, families were significantly more likely to have daily contact with a grandparent, and this was especially marked in the B cohort. (This of course is affected by the fact - seen in section 2.3 - that grandparent co-residence is more likely in these families.) Children with older parents are significantly less likely to have regular face-to-face contact with their grandparents. This is likely to be related to the grandparents being older themselves when parents are older, such that grandparents' capacity for face-to-face contact with grandchildren may be adversely affected by their frailty or ill health, or perhaps more constrained financial circumstances. The main finding related to the primary carer's educational attainment is that of daily contact being more likely when the educational attainment is lowest. Again, this is likely to reflect the higher rates of grandparent co-residence in the households of the least educated primary carers. It is also possible that these families are less able to afford formal child care, and therefore regular child care is more likely to be provided by grandparents. Weekly or monthly contact with a grandparent was somewhat more likely when both parents (or the parent in single-parent households) were employed. Having daily grandparent contact was most likely if one of the parents mainly spoke a language other than English at home, which may reflect high rates of grandparent co-residence. However, these data also show relatively high rates of non-contact with grandparents in these families, which is likely to be due to geographical distance. Notes: Significance (chi-square) tests used to compare, for each variable, the proportions with different levels of contact with grandparents. *** p < .001; ** p < .01; * p < .05; ns p > .05. Percentages may not total exactly 100.0% due to rounding. This chapter looked at three broad aspects of possible grandparent involvement in children's lives. First, the co-residence of grandparents with children was explored through analyses of grandparents who live with the study children and their parent/s in multi-generational households. Second, grandparents as child care providers was explored. Third, children's contact with grandparents was explored. These different perspectives allow us to see some of the varied ways grandparents' and grandchildren's lives may intersect, providing opportunities for building relationships, help and support across generations. Overall, the analyses of grandparents' co-residence confirmed that it is not common in Australia for children to have a co-resident grandparent. Percentages are highest among the 0-1 year old children, at 7% of these children, or more than an estimated sixteen thousand 0-1 year old children across Australia. The very young children in single-parent households quite often shared a home with a grandparent. These analyses also showed that having a co-resident grandparent was more likely for some other demographic groups; in particular, those with young parents and from culturally diverse backgrounds (as indicated by language spoken at home). These patterns may reflect, in some families, a means of addressing housing and financial security, while in others, they may reflect cultural aspects of family formation. These findings are consistent with other research on grandparent co-residence, and on multi-generational families in Australia and the United States (Dunifon et al., 2014; Mutchler & Baker, 2009; Pilkauskas & Martinson, 2014). There were clearly advantages for many families in having co-resident grandparents. This is especially true in single-parent households, as was observed for the United States by Mutchler and Baker (2009). For example, comparing single parents with a co-resident grandparent to those without, housing tenure was more often described as living rent-free when there was a co-resident grandparent, financial hardships were less often experienced, and there was significantly greater access to help or support within the family. In couple-parent households, the presence of a grandparent did not seem to confer benefits to the family to the same degree, suggesting that there may be different reasons for this co-residence, perhaps to benefit the grandparent or for reasons unrelated to the economic circumstances of the parent(s). The analyses of the characteristics of the grandparents themselves highlighted some differences for single-parent versus couple-parent households, with younger grandparents in single-parent households than in couple households; and grandparents in couple households more likely to speak a language other than English than those in single-parent households. Families without grandparents living with them are still often able to draw upon their help, with grandparent-provided child care being a common way that grandparents provide assistance to families. Grandparent care is often used as a supplement to other forms of care, with formal care still playing an important role in many families, even those who do use some grandparent care. Children are generally not cared for by grandparents for very many hours per week, with the average ranging from 6.4 hours when children were age 0-1, to 2.3 hours per week for 4-5 year olds. However, at least for young children, it tends to be flexible (being provided in the home of the child or the grandparents) and free: two factors that are no doubt valued by parents. Even when non-resident grandparents do not provide regular child care, a significant proportion still see their grandchildren frequently. That is, for many grandparents, their relationship with their grandchildren involves attention and attachment, but little day-to-day interaction, as described by Mutchler and Baker (2009). Our analysis has shown that while most children have at least monthly contact with a grandparent, regular contact with maternal grandparents is more common than with paternal grandparents, and, as one would expect, contact with paternal grandparents is much less common in single-parent households. (i.e., child care or contact) more often involved maternal than paternal grandparents. This was most apparent in single-parent households but was also apparent in two-parent households. The focus of grandparent involvement according to ages of children was a particular contribution of this chapter, made possible by the longitudinal nature of LSAC and the collection of information about grandparents from children's perspectives. These analyses showed that grandparent co-residence was most prevalent among the youngest children, especially among children living with single parents. Very few children lived with grandparents at multiple waves of LSAC, however, indicating that grandparent co-residence may be a temporary means of helping families through times in which financial or other forms of support are most needed. Grandparent involvement through providing child care is more common for children under-school age than older children, but even when children are in school, grandparent care is used instead of or as well as other forms of care. We know from other research that this grandparent care is highly valued by many families for children of varied ages (Baxter & Hand, 2016; Wheelock & Jones, 2002). In looking at children's contact with grandparents, this contact, of course, changes in nature as children grow. We saw declines in contact with grandparents as children grew older, with some of this likely to be related to the ageing and death of grandparents themselves. Nevertheless, the majority of children remained in some contact with grandparents over the ages studied here. These analyses provide insights into the ways different generations within families support each other. Such support may be especially valued, indeed required, by those families who have difficulties accessing the resources or services they need. This might apply especially to parents who have problems accessing affordable housing or who are unable to access sufficient levels of financial assistance to meet their costs of living. For such parents, living with their own parents may alleviate significant financial difficulties, although this may not be an option for all in this situation. The availability and location of grandparents, the nature of the relationships with, and economic circumstances of the grandparents themselves will matter in making choices about grandparent co-residence. These factors, along with grandparents' age, health and employment status, are also likely to be relevant in respect to whether grandparents are available to provide child care and, to some extent, their availability to be in contact with grandchildren. Having the LSAC data on grandparent involvement only from the perspective of the children, rather than the grandparents themselves, means that we have not been able to consider all these factors. Further, decision-making about grandparent co-residence or child care may depend upon the extent to which this grandparent involvement results in a better situation than any alternatives. In the case of grandparent co-residence, if government or other community assistance is available and able to support a family with children to live independently, then this may be a preferred alternative for some (Pilkauskas & Martinson, 2014). (See Pebley and Rudkin (1999) for a discussion of these issues and a review of the literature.) In the case of child care, while grandparent care is a valued form of child care, there are likely to be some families that use this form of care because formal care options do not meet their needs, perhaps due to affordability or availability at a location or hours that meet their needs. Grandparents may be called upon for specific help at particular life stages, such as when parents are going through transitions in employment or relationships. This might be reflected in patterns of co-residence during such times. However, where grandparental involvement in directly providing help is most apparent in these data is through the provision of child care. For some families, this may reflect that formal services are not available, not affordable or do not suit the parents' work hours (e.g., for weekend work). However, for others, this may reflect a preference by parents for children to be cared for by family. An important question is, of course, how does grandparental involvement make a difference to children? We have not explored this here, as key information about the nature of grandparental involvement is missing from LSAC. In particular, to ask about grandparents' influence on children, we might want to know about grandparents' style of communication or "parenting" of children, or the types of activities done while together. We could likewise ask about the wellbeing of grandparents who are more (or less) involved in their grandchildren's lives, and their feelings about the level of involvement they have. Given that grandparental involvement is part of many families' lives, more research on these questions would be of value. Barnett, M. A., Scaramella, L. V., Neppl, T. K., Ontai, L., & Conger, R. D. (2010). Intergenerational relationship quality, gender, and grandparent involvement. Family Relations, 59(1), 28-44. Baxter, J. A. (2013). Childcare participation and maternal employment trends in Australia (AIFS Research Report No. 26). Melbourne: Australian Institute of Family Studies. Baxter, J. A. (2014). Care for children in school holidays. In The LSAC annual statistical report 2013, (pp. 31-50). Melbourne: Australian Institute of Family Studies. Baxter, J. A., Gray, M., Alexander, M., Strazdins, L., & Bittman, M. (2007). Mothers and fathers with young children: Paid employment, caring and wellbeing (Social Policy Research Paper No. 30). Canberra: Department of Families, Community Services and Indigenous Affairs. Baxter, J. A., & Hand, K. (2016). Flexible child care for Australian families: Parent perspectives (Research report). Melbourne: Australian Institute of Family Studies. Baydar, N., & Brooks-Gunn, J. (1998). Profiles of grandmothers who help care for their grandchildren in the United States. Family Relations, 47, 385-393. Brandon, P. (2000). An analysis of kin-provided child care in the context of intrafamily exchanges. American Journal of Economics and Sociology, 59(2), 191-216. Brennan, D., Cass, B., Flaxman, S., Hill, T., Jenkins, B., McHugh, M., Purcal, C., & valentine, k. (2013). Grandparents raising grandchildren: Towards recognition respect and reward (SPRC Report No. 14/13). Sydney: Social Policy Research Centre. Dunifon, R. E., Ziol-Guest, K. M., & Kopko, K. (2014). Grandparent coresidence and family well-being implications for research and policy. The ANNALS of the American Academy of Political and Social Science, 654(1), 110-126. Fergusson, E., Maughan, B., & Golding, J. (2008). Which children receive grandparental care and what effect does it have? Journal of Child Psychology and Psychiatry, 49(2), 161-169. Goodfellow, J., & Laverty, J. (2003). Grandparents supporting working families. Family Matters, 66, 14-19. Gray, M., Misson, S., & Hayes, A. (2005). Young children and their grandparents. Family Matters, 72, 10-17. Griggs, J., Tan, J. P., Buchanan, A., Attar‐Schwartz, S., & Flouri, E. (2010). 'They've always been there for me': Grandparental involvement and child wellbeing. Children & Society, 24(3), 200-214. Hand, K., & Baxter, J. A. (2013). Maternal employment and the care of school-aged children. Australian Journal of Labour Economics, 16(3), 329-349. Hand, K., Baxter, J. A., Sweid, R., Bluett-Boyd, N., & Price-Robertson, R. (2014). Access to early childhood education in Australia: Insights from a qualitative study. Melbourne: Australian Institute of Family Studies. Hank, K., & Buber, I. (2009). Grandparents caring for their grandchildren: Findings from the 2004 survey of health, ageing, and retirement in Europe. Journal of Family Issues, 30(53), 53-73. Horsfall, B., & Dempsey, D. (2011). Grandmothers and grandfathers looking after grandchildren: Recent Australian research (Family Relationships Quarterly No. 18). Melbourne: Australian Institute of Family Studies. Horsfall, B., & Dempsey, D. (2013). Grandparents doing gender: Experiences of grandmothers and grandfathers caring for grandchildren in Australia. Journal of Sociology, 1440783313498945. Jenkins, B. (2010). Grandparent childcare in Australia: A literature review. Elder L. Rev., 6, 1. Mueller, M. M., & Elder, G. H. (2003). Family contingencies across the generations: Grandparent-grandchild relationships in holistic perspective. Journal of Marriage and Family, 65(2), 404-417. Mutchler, J. E., & Baker, L. A. (2009). The implications of grandparent coresidence for economic hardship among children in mother-only families. Journal of Family Issues, 30(11), 1576-1597. Ochiltree, G. (2006). The changing role of grandparents (Australian Family Relationships Clearinghouse Briefing No. 2). Melbourne: Australian Institute of Family Studies. Pebley, A. R., & Rudkin, L. L. (1999). Grandparents caring for grandchildren what do we know? Journal of Family Issues, 20(2), 218-242. Pilkauskas, N., & Martinson, M. (2014). Three-generation family households in early childhood: Comparisons between the United States, the United Kingdom, and Australia. Demographic Research, 30(60), 1639-1652. Tan, J.-P., Buchanan, A., Flouri, E., Attar-Schwartz, S., & Griggs, J. (2010). Filling the parenting gap? Grandparent involvement with UK adolescents. Journal of Family Issues, 31(7), 992-1015. Vandell, D. L., McCartney, K., Owen, M. T., Booth, C., & Clarke-Stewart, A. (2003). Variations in child care by grandparents during the first three years. Journal of Marriage and Family, 65(2), 375-381. Weston, R., & Moloney, L. (2014). Inquiry into grandparents who take primary responsibility for raising their grandchildren: Submission from Australian institute of family studies. Weston, R., & Qu, L. (2009). Relationships between grandparents and grandchildren. Family Matters, 81, 58-60. Wheelock, J., & Jones, K. (2002). 'Grandparents are the next best thing': Informal childcare for working parents in urban Britain. Journal of Social Policy, 31(3), 441-463. 1 Chapter 3 in this volume, also includes some analysis of co-residence of grandparents. 2 Families that comprised a biological parent plus a grandparent that had been classified as a two-parent family were re-classified for these analyses to be a single-parent family, so that the grandparent was not counted as a "parent" as well as a co-resident grandparent (a total of 51 changes across waves and cohorts). 3 Having a parent living elsewhere may be especially relevant in considering children's involvement with the grandparents related through the parent who lives elsewhere, and while this is most likely to apply in single-parent families, it is also the situation for some children in couple families. Various factors are likely to make a difference to grandparent involvement, including the level of involvement the child has with the parent living elsewhere, which in itself may also depend on whether the child's primary carer has re-partnered. Grandparent involvement may be different again for children who have only one living (biological) parent. This is more often the case in single parent rather than couple parent families, although within LSAC the numbers affected are small. 4 From the LSAC household data, maternal relationships could only be directly identified if there was a mother in the family and likewise paternal relationships could only be identified if there was a father in the family. To derive grandparental relationships for other families if the grandparent was said to be "other relative, in law" to the primary carer, and grandparent to study child, then it was assumed this was a paternal grandparent if the resident LSAC parent was female and a maternal grandparent if the resident LSAC parent was male. 5 Grandparents who are visitors or temporary household members are not included. A very small number with co-resident great-grandparents were included in the estimated proportion with grandparents. 6 If the likelihood of having a co-resident grandparent is examined across all waves of LSAC, with the above characteristics examined together with the age of the youngest child, all significant findings described above except those relating to parental education remained statistically significant. This is based on a logistic regression model in which the repeated observations across waves are taken into account with a random effects model. 7 These are the hardships asked about at each wave. Parents were asked whether they had experienced any of these due to a shortage of money. 8 LSAC estimates of the percentages of children in grandparent care are somewhat lower than those reported by the Australian Bureau of Statistics (ABS). This may reflect the instruction to parents in LSAC to exclude casual or occasional babysitting, which could be included in the ABS collection. The LSAC estimates were 18% for 0-1 year and 2-3 years, and 20% for 4-5 years. The ABS reported that in 2011, 23% of under-one year olds, 36% of 1 year olds, 34% of 2 year olds, 29% of 3 year olds and 30% of 4 year olds were usually cared for by a grandparent. If the ABS data are instead used to estimate the percentage of children cared for in the reference week of the ABS survey, the percentages decline to 17% of under-1 year olds, 27% of 1 year olds, 25% of 2 year olds, 21% of 3 year olds and 20% of 4 year olds. The "usual" figures are as presented in the ABS online tables. The "last week" figures were derived from the ABS CURF. 9 Waves 1 and 2 of the K cohort were not used in these analyses of grandparent child care. The questions used at these waves differed to those used at later waves and, in particular, resulted in considerably lower than expected percentages in grandparent care at Wave 2 when aged 6-7 years (13% cared for by grandparents, compared to 17% from Wave 4 of the B cohort). The Wave 1 K cohort estimate for 4-5 years was 17%, compared to 20% for the B cohort at Wave 3. 10 This is largely in relation to mothers' employment status, with longer work hours associated with a greater use of child care. 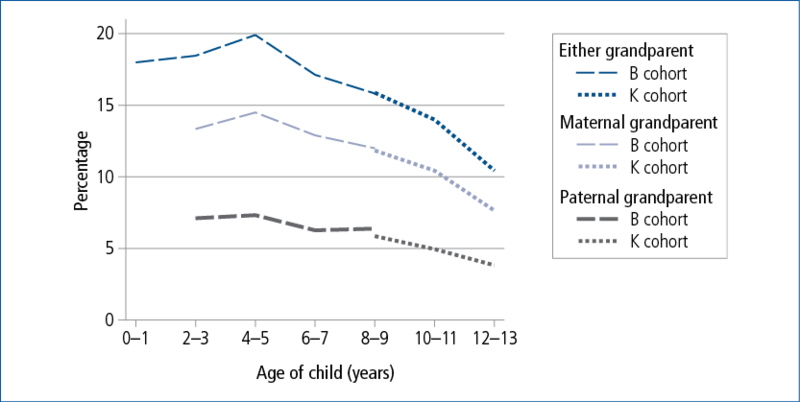 Fathers' employment status also matters, in that children are less often in child care when fathers are not employed full-time. 11 In this section, the K cohort, Wave 1 data on grandparent-provided child care have been included. While the overall percentage in grandparent care is lower than in the B cohort at Wave 3 (and so was excluded from the previous analyses), on most characteristics of the grandparent care described here, the findings were very similar for the B cohort and the K cohort at age 4-5 years. 12 In each of the following, the small discrepancy between the sum of the hours spent in different types of care and the total hours in care given is due to rounding. 13 If children were cared for by more than one grandparent (or sets of grandparents) this information refers to the one with whom children spent more time. This information is reported by the primary carer. 14 At Wave 1 there were 210 grandparent-carer responses (12% of families reporting some grandparent care) and at Wave 2 there were 239 grandparent-carer responses (26% of families reporting grandparent care). 15 As noted in Section 2.2, children in couple families may be living with a parent who has re-partnered, also having a parent living elsewhere, so this situation does not exclusively apply to single-parent families. Some children also have a parent who has died, and to what extent grandparent contact is disrupted in these families is unknown. 16 In Wave 1, the study child's primary carer was asked how much contact the child has with their grandparents (specifically, how often the study child gets together with, sees or spends time with their grandparents). Response categories ranged from 1 (no contact) to 6 (every day). The questions changed in Wave 2. From Waves 2 to 4, the primary carer was asked how often the child gets together with their (the primary carer's) parents and, in a separate question, with the parents of their partner or spouse. If Parent 1 (the child's primary carer) was the child's biological, step, adopted or foster mother, Parent 1's responses about contact with their parents were coded as contact with the child's maternal grandparents, and their responses about contact with their partner's parents were coded as contact with the child's paternal grandparents. For the few cases where Parent 1 was the (biological, step, adopted or foster) father of the study child, Parent 1's responses about contact with their own parents were coded as contact with paternal grandparents; and responses about contact with their partner's parents were coded as contact with maternal grandparents. Cases where Parent 1 was not the child's biological, step, foster or adopted parent were excluded from the analysis. Wave 5 questions were similar, but specifically referred to "Parent 2's" parents, rather than those of the partner or spouse. (This may result in the identification of "step-grandparent" relationships, if the partner/spouse is not the child's parent.) These data, however, do not adequately capture grandparent contact for single-parent families (see the next footnote). 17 From Wave 2, when children had a parent living elsewhere, the primary carer in LSAC was asked whether the child had any contact with the parents of that parent living elsewhere. This was captured as "yes" or "no", such that the frequency of contact is not collected. For the frequency of contact we referred to information from the parent living elsewhere (PLE), where he (or she) was a participant in LSAC through the parent living elsewhere component of the study. In this questionnaire, in Wave 2, respondents were asked whether the study child sees their parents "often", "occasionally" or "never". In subsequent waves the response categories corresponded to those used in the primary carer's interview. For these analyses, Wave 2 PLE responses are coded as "at least monthly" if the response was "often" and "less than monthly" if the response was "occasionally". In families with a PLE but no PLE respondent, the frequency of contact was based on the "yes" or "no" provided by the primary carer. In these cases, we assumed "yes" was equal to be at least monthly for the purposes of analysing aggregate levels of contact. 18 When children with a resident maternal grandparent or a maternal grandparent who provided regular child care were excluded from the analysis, the patterns of contact were quite similar for single-parent and two-parent households. As expected, the percentage of children who had daily contact in either case was smaller. In two-parent households, the percentage of children who had daily contact was 5% or less across all age groups. In single-parent households, it was slightly higher, ranging from 5% to 9%. 19 When children with a resident paternal grandparent or a paternal grandparent who provided regular child care were excluded from the analysis, the figure was almost identical, perhaps because the proportion of children with resident paternal grandparents was very low and it was less common for paternal grandparents than maternal grandparents to provide regular child care.